LEGO® Trains | Outer Rim Trading Co. - flat rate shipping Australia wide. All aboard the LEGO® express! 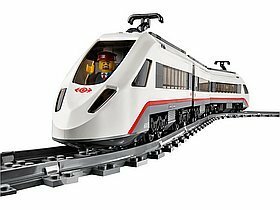 Building the ultimate LEGO® City railway system has never been easier with the new flexible track system and eight-channel, seven speed infra-red remote control. Load and unload the cargo train with the big crane or just get all those waiting passengers to their destinations. There are so many amazing details waiting just for you!